DETROIT (AP) — After grounding into a double play to end the top of the seventh inning, Shin-Soo Choo still held out hope that he’d have another chance to extend his on-base streak. “I still believed I’d get another at-bat,” Choo said. Choo’s Texas teammates came through, reaching base enough times to bring him back to the plate with two outs in the ninth, when he hit an infield single to extend the streak to 47 games. Choo surpassed Julio Franco’s club record of 46 games, set in 1993 — and the Rangers blanked the Detroit Tigers 3-0 on Sunday. Austin Bibens-Dirkx pitched impressively into the sixth inning for Texas, and Jurickson Profar homered in the first. Choo reached on an error in the second, but he was without a hit or a walk after seven innings. The Rangers sent five men to the plate in the eighth, and Ronald Guzman’s one-out single in the ninth allowed Choo to bat again. He hit a slow grounder to third and made it to first without a throw. Bibens-Dirkx (2-2) allowed three hits and a walk in 5 1/3 innings. He struck out five. Jose Leclerc struck out five in 1 2/3 hitless innings of relief for Texas. Jake Diekman pitched the eighth, and Keone Kela finished for his 22nd save in 22 chances. Texas manager Jeff Banister was ejected in the second inning after one of his players was called out for interference. “He got us deep into the game and gave us a chance, but we didn’t do anything offensively,” Detroit manager Ron Gardenhire said. 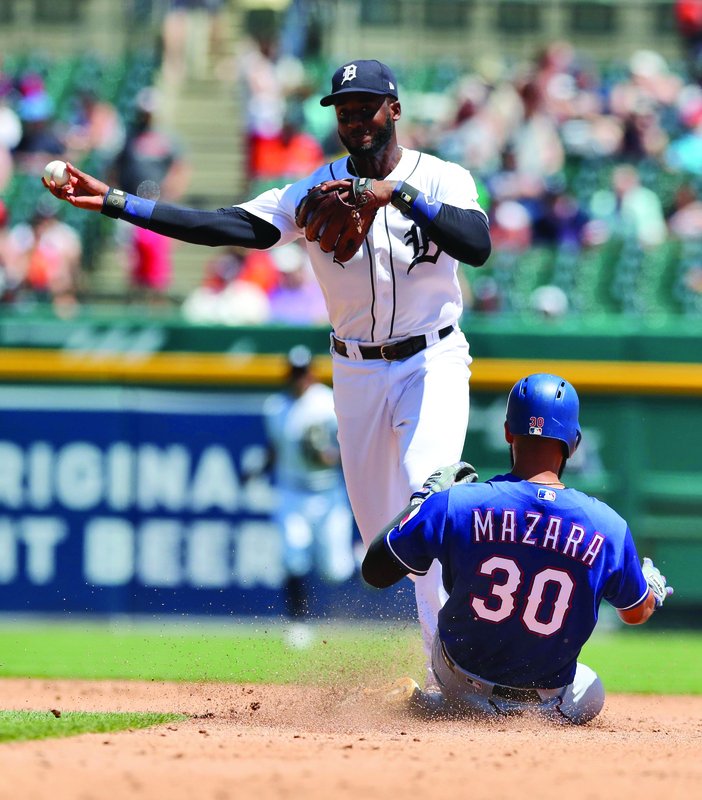 Detroit scored seven runs in the first inning of a win Saturday, but the Tigers have not crossed the plate since. This time it was Texas that took the lead in the opening inning on a solo homer by Profar. The Rangers went ahead 2-0 in the second on an RBI single by Guzman. With men on first and second, Carlos Tocci dropped a bunt and was hit by the throw as he neared first. The ball bounced away, and it looked like Texas had scored another run, but Tocci was called out for interference, and the runners were sent back to first and second. Banister argued and was ejected. Choo followed with a grounder that skipped past first baseman John Hicks for an error, and a run scored on that play to make it 3-0. Choo was named to his first All-Star team Sunday. He said he found out before the game. Detroit’s representative was a bit of a surprise. Reliever Joe Jimenez was rewarded for posting a 2.85 ERA in 41 innings. It was the 14th ejection of Banister’s managerial career and his third this season. Texas acquired RHPs Cory Gearrin and Jason Bahr and OF Austin Jackson from the San Francisco Giants for a player to be named later or cash. Tigers INF Dixon Machado was sent outright to Triple-A Toledo. Detroit also optioned RHP Artie Lewicki to Toledo. Rangers: Texas moved RHPs Matt Bush (right elbow strain) and Tony Barnette (right shoulder strain) to the 60-day DL. Tigers: OF Nicholas Castellanos was a late scratch with mild left wrist soreness. … Detroit announced that RHP Drew VerHagen (nasal fracture) will be reinstated from the DL before Monday’s game. Texas LHP Mike Minor (6-4) takes the mound Monday night against Red Sox LHP Eduardo Rodriguez (10-3) in the start of a three-game series at Boston. Detroit begins a three-game set at Tampa Bay, with Tigers LHP Francisco Liriano (3-5) starting against RHP Chris Archer (3-4).